I received certificates from Assiniboine Community College in 1973 for Stenography, and in 1992 for an Office Skills Refresher course. I’m now in third-year studies at Brandon University in Creative Arts, majoring in Visual Art and Creative Writing. The greatest and most rewarding accomplishments of my life have been sharing my life with my husband Reg, mothering our five children and grand-mothering our twelve grandchildren. I also enjoy our rental-property business that began with the entrepreneurial spirit of my mom, who is now 94. I would credit her guidance as a sagacious contribution to my education. I’m proud to be a senior back at school, and I’m honoured to be a member of the Golden Key International Honour Society. I’m presently a member of the Manitoba Writers’ Guild, Inscribe Christian Writers’ Fellowship and The Word Guild. I enjoyed growing up in Brandon with my five siblings, and was part of the hippy generation of the late sixties. After marriage I spent several adventurous years moving around Manitoba, Alberta and B.C. until I returned to this beautiful city. I was a stay-at-home mom, and then spent a few years working in reception/clerical positions, first at the YMCA, then at the Brandon Regional Health Centre. Outside of family and work, I was primarily involved in church-related activities, facilitating small groups in my home, church and community. I’ve also had the incredible privilege to travel to several countries. Two visual artists profoundly affected my interest in painting: Colleen Cutschall with her exhibition, “Voice in the Blood” at the Art Gallery of Southwestern Manitoba in 1990, and Moshe Tzvi Berger in his Museum of Psalms in Jerusalem, Israel in 2006. My interest in writing began with poetry when I was very young, and then I began keeping a diary or journal. I’ve always had a lot to say, and writing is one way to do it. I want to paint beyond what I can visualize, and I want to write of things outside the visible world. So many paths could be, and have been, taken. Now, my philosophy in life is simply gratitude and love. I’d like to spend the rest of my life in the company of family and friends. I want to paint and write. I hope to encourage others to lovingly explore the unknown through creativity. Linda Tame was my student in three third year Creative Writing courses over the past two years: Creative Writing (Poetry); ELUCIDATA: Multimedia Poetry; and The Multigenre Multimedia Disjunctive Poetic Narrative Dream Text. 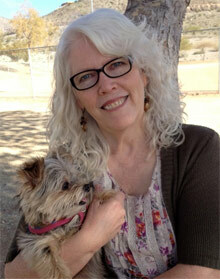 Linda is a “mature” student (in her 60s) in the Creative Arts, with Creative Writing and Visual Arts double major. She is an accomplished painter as well as writer, and brings a wealth of life experience and professional expertise of various kinds to her work, far beyond what is expected in an undergraduate program. She is adventurous and playful in her creative arts explorations, and “deep” in both the formally experimental and humanly engaged senses. In all three courses, Linda distinguished herself with outstanding work of a professional calibre. She contributed a lot of insight and fun and wisdom to the class discussions, and showed herself to be adept at learning new skills such as the video-making and editing skills taught in the Multimedia Poetry workshop – even though she found herself in a class of young men who were much more versed in computer skills than she was. She never let this bother her one bit, and brought humour and grace to each tutorial and discussion, and produced an exquisite set of poetry videos that everyone who has seen them finds very moving. Linda is not only a great student and artist and writer, she is also a great role model for other women, and inspiring in her ongoingly adventurous spirit and commitment to a high level of creativity and artistic expression.